As a seamstress since age 13, I have collected a variety of colored spools of thread through the years. Stored in boxes and cabinets, at times the threads get intertwined and end up in a complete mess of knots. My response is to patiently untwine the threads or cut off the knots and reorganize the spools. Finding solutions to knotted and tangled threads is easy. Finding answers to knotted and tangled tragedies in our world seem insurmountable. The intertwining messes of deadly shootings, catastrophic storms, loss, and destruction need solutions. But the solutions are more than human sized. We watch from a distance or sit with those who are hurting and wonder “what can I do”? In these tragic times, we as believers in Jesus know that only God Almighty has the solutions to the messes around us. He knows that we live in a broken world full of sin and evil. And His heart is broken over this evil. God most often chooses to show his compassion for the hurting through the actions of His people. So what is our most fruitful response to those people who live far away or close by? The most fruitful response is to PRAY. What do we pray for those who are hurting and suffering through tragedies? 1. Pray that they will know God’s comfort and peace. 2. Pray that those who don’t know God personally will come to trust His great love for them through Jesus. 3. Pray for God to give them wisdom and guidance in making daily decisions in their trials and sufferings. 4. Pray for other Christians around them to show compassion and mercy, serving them with kindness as they give to their physical needs. Will you respond to the recent tragedies in our nation and communities by committing to pray 10 to 15 minutes daily for these individuals and their lives? Ask another friend to pray together with you in your home, on the phone, through a text. We need the hand of God to move in a mighty way in our nation and He hears our prayers as we ask Him to work. The fruitful response of our prayers can change our world because Almighty God, who is loving and compassionate, is all powerful. He can do anything as we trust in Him to answer our prayers. What burdens are you carrying today? What fears? What needs do you have? What do we do with them? This past year, I have joined with others locally and across our nation, to pray earnestly, unceasingly, not like before, as we have been burdened and fearful for our nation- the loss of religious freedoms, the ever encroaching evil in our culture and the fight for godly values in our homes and schools. God is working mightily through our prayers on a large scale. Daily we feel the pressures and burdens living in this world. Satan tempts us to believe that God doesn’t care. He has left us. So, we decide to worry and fret, overwhelmed by carrying these burdens ourselves. But when I choose to go to God in prayer and give these cares to him, I do not go away empty handed – God gives me himself in return, his joy and his peace. As I abide with God in a close relationship with him, praying daily and hourly for mine and others’ burdens, I can trust he will work things out in his good timing. Then God produces the peace and joy I need in my circumstances. My spirit is refreshed and I become refreshment to those living in darkness around me. Hopeless, they are burdened with sins and sorrows wandering around looking for someone who cares. I can lead them to our God and to His son, Jesus, who takes the burdens of those who call out to him and desire to live godly lives. So there are two choices for me and you today as God’s children: 1) worry and fret until I am overwhelmed and totally stressed in my circumstances or 2) give my burdens to God through prayer and experience His peace and joy, trusting in a good and powerful God who loves me. And the debates continue. Not the current political debates or the debates over social reform or world order. But the debates focused on one man in history. This man caused uproar over 2 thousand years ago. And that battle continues today– in the market place, the center of governments, among religious leaders of various faiths and among worldly scholars and educators. That is why on this day, a sad day of death and evil crucifixion on a cross, we can say it is “good”. It was and still is “good” for every person who will trust in God’s love and forgiveness through his Son Jesus. Jesus suffered for our good. But until that day we who know Jesus Christ as the risen Lord and Savior of the world, will continue to “preach Christ crucified”. We who follow the True Vine, Jesus, may continue to debate with others, be persecuted for our faith in the cross, and even die through beheadings. The message is still the same for each generation, and I for one, will continue to write about this message with joy. Have a blessed Good Friday! It is a good day! Death and destruction seem to be everywhere recently. Chaos, darkness, and despair have brought many to experience hopelessness and fear. For centuries, our world has been shaken by violence, wars, plagues and disasters. This has been the same in every nation past and present and to every people group. It’s nothing new; it’s just new to each generation. The recent earthquakes in Nepal, the destruction of churches and Christian homes by IS militants, and the violent riots in the U.S. have destroyed not just buildings but lives, thousands of lives. Can things get worse? Maybe. Is there any hope? Always. In a world that seems hopeless there is an answer. There has always been an answer yet throughout history most have rejected the only true Hope that brings real peace and joy. But others continue to accept and even give up their lives for this Hope; their hope is knowing the Creator God and His eternal love. 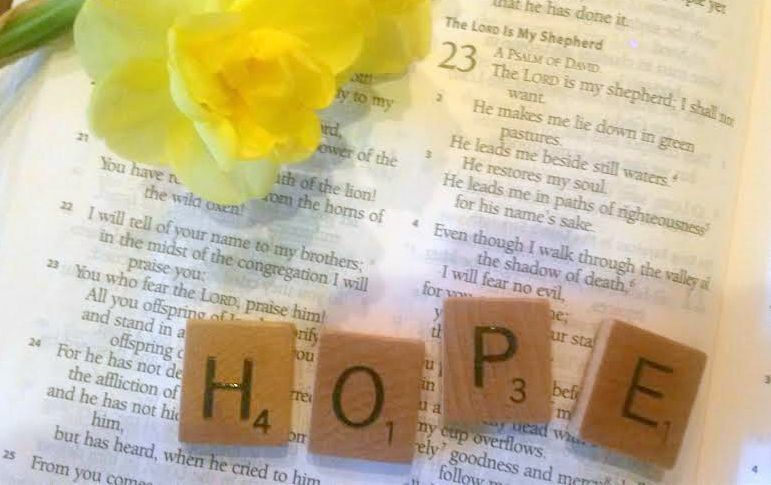 Do you know this hope? The hope of eternal life with God through His Son, Jesus Christ? If you do, then, you have the answer for the world, to those around you who are hopeless and shaken by these recent events. Peter told the Christians who were living in desperate times of persecution for their faith to be ready at any time to share this Hope with others. Like the Egyptian men in Libya, would someone see my “immense faith” in Jesus and say, “her God is my God”? I hope so. How about you?